It’s no secret that people love their pets and are willing to shell out big bucks for them. The American Pet Product Association is estimating that Americans will spend $55.53 billion on pets in 2013. So it’s not surprising to see new businesses catering to man’s best friend. It might be uncommon, however, to find one of those businesses in a farmers market. But that’s what Loretta M. Carter, 53, Wyomissing, did when she opened Scooter’s Canine Creations LLC at a stand in the Fairgrounds Farmers Market. Carter sells homemade, all-natural dog treats and cakes. The stand opened in April. Carter previously sold products from home. 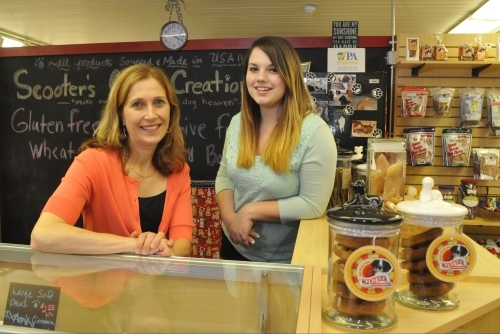 The business traces its roots back six years when Carter’s daughter, Emma, now 19, wanted a dog. Carter began experimenting with recipes to make treats and cakes that were nutritious for dogs. Her sister, Stella Volpe, was working as a professor at the University of Pennsylvania at the time and enlisted the help of veterinarians working at the school. In 2010, Carter began selling her treats to friends, and the business snowballed. It was only fitting that Carter should name her new business after the family dog, Scooter. “Dogs with health or allergy issues can tolerate these treats, but all dogs love them,” she said. The dog treats are certified by the state to ensure that dog lovers know what they are feeding their pets. Carter said she started selling the treats at craft shows, other events and wholesale to a handful of area stores. Last fall, Carter noticed a vacant stand at the market. She was encouraged by her son, Benjamin, to take a risk and try selling her products at there, she said. From November to April, Carter and her two children worked to furnish the stand with food cases and custom-made displays. “I knew exactly how I wanted this stand to look, so it took a little longer than we first expected,” she said. The shoppers have been receptive. Natosha Brown, Reading, has a dachshund/Chihuahua mix that was found to have a cancerous tumor on his pancreas. She buys special treats for Rocky there. In addition to the treats, Carter sells small cakes for dogs in the shape of a paw print, and for a birthday celebration she makes a dog cupcake that looks very much like a human cupcake from the neighboring bakery stand. Carter said she always knew that she had wanted to have her own business, but envisioned a coffee shop. “I never thought I’d be doing something like this, but I believe when something is meant to happen things do fall into place,” she said. Contact David A. Kostival: 610-371-5049 or money@readingeagle.com. This entry was posted in Featured, Speciality Goods by STRYV Creative. Bookmark the permalink.